This is the type of sandwich you eat with abandon. Where you let the sauce drip down your hands, the crumbs stick to your face, and forget about the judgement of other people who may be watching you. It's going to get messy in here and they can deal with it. There is a lovely restaurant within walking distance of our apartment. We went for lunch one sunny day a few weeks back and ordered their grilled trout po' boy. Our server warned us it wasn't the kind of sandwich you want to order on a first date, since you truly are a sight to behold when eating it. That wouldn't be a problem for us as we've been watching each other eat for the past seven years and have seen far worse. In the end, it was worth the mess a hundred times over. The fish was tender, the sauce tangy, the cabbage crunchy and refreshing, all nestled within a soft, chewy french baguette. It was everything. The thought of that sandwich lingered in the back of my mind until some time later, when I found myself at a beer hall with friends late one night, chowing down on a bratwurst topped with an unconventional jalapeño jicama coleslaw. 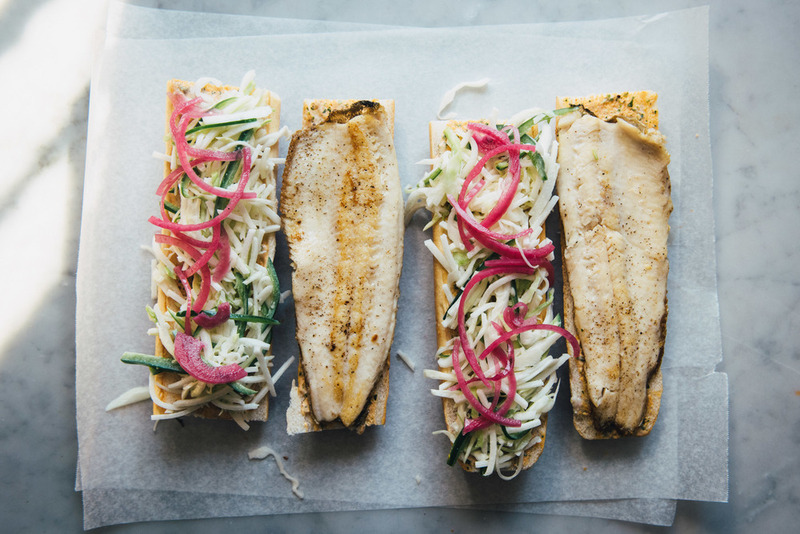 I don't know if it was my half delirious state of mind, but an idea was suddenly born: I must make my own version of the trout po' boy with this delicious new slaw I've just discovered! A few test runs and photographs later, and that's how I found myself here, sharing this recipe with you. This recipe provides rough measurements for 1 sandwich which can easily be doubled, tripled and more. I don't know anyone who measures sandwich ingredients exactly, so I wanted to give you guys the flexibility to make it the way you like. The cole slaw recipe yields enough for plenty of sandwiches (8 to 10ish), but can also be enjoyed as a side. You can use either store bought remoulade or make your own. I use a really great Serious Eat's recipe, which you can find here. I didn't post my own version because theirs is perfect already. Finally, you can use either regular pickle slices or pickled onions (my preference). If you also prefer the latter, you can find my go-to recipe for pickled onions here. In a large bowl, combine cabbage, jicama, and jalapeños. In a small mixing bowl, add mayonnaise, vinegar, sugar, and salt. Whisk to combine. Toss dressing with the shredded vegetable mixture until thoroughly coated. Cover and chill in the refrigerator for at least 1 hour to let the flavors come together. To make the fish, take the trout filet and dry it well on both sides. Place the filet, skin side up on a plate and dab the skin again to remove any excess moisture. Let sit (to air dry) for about 10 minutes. Place a stainless steel or cast iron pan over medium high heat. Once the pan is hot, add oil and coat the entire bottom of the pan. Add the fish to the pan, skin side down, and sprinkle it with salt and pepper. Cook the fish for 4 to 5 minutes, letting it go largely undisturbed, but occasionally pressing down lightly to ensure the skin gets crispy. Once the fish is mostly cooked through, gently lift the filet and flip it with a fish spatula—if the skin is sticking to the pan at all, use your spatula to gently work it off before flipping. Let cook for another minute before transferring to a clean plate. To assemble the sandwich, split the french bread lengthwise. Slather a layer of remoulade on both halves. Place the fish on the bottom half, add slaw, pickles, and finish with the top half. Enjoy immediately.